Bernie and Jude Uebersetzig are retired public school teachers who live in Pickerel, WI in the summer and in LaFeria, TX during the winter. 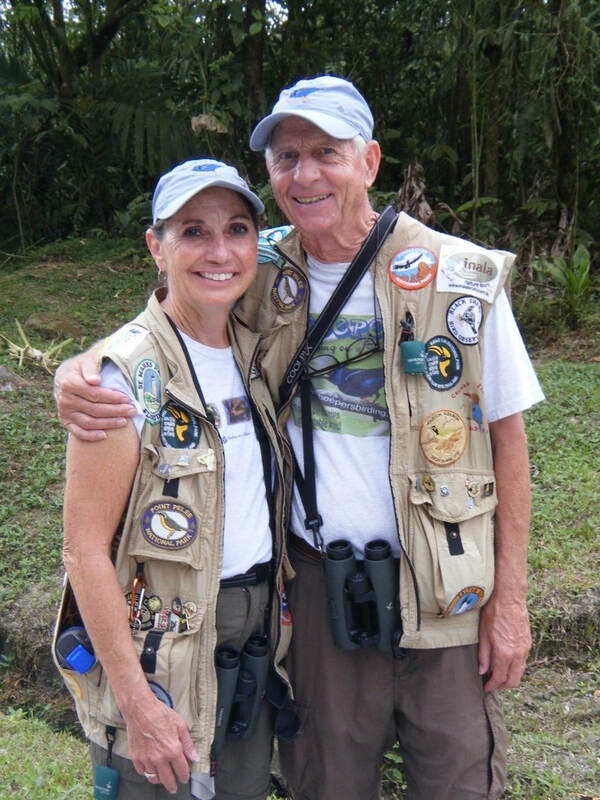 They have been birding since the 1960s, at first casually, and then more seriously as they spent most summers from 1975 until 2000 traveling throughout the United States hiking, backpacking, and observing birds. Once they retired in 2000, birding began to occupy a large portion of their free time, along with golfing. The Uebersetzigs took their first international trip to Mexico in 2008 as an extension to the Rio Grande Valley Birding Festival. It was at this festival that they met the Beckmans in 2009 and signed up for a Panama trip, and the rest is history. They have now traveled 14 times with Cheepers! to destinations on five continents: Panama (3 times), Honduras, Costa Rica, Ecuador, Brazil & Argentina, Thailand, Nepal, India, Australia, South Africa & Lesotho, Namibia, Madagascar; they will join a tour to Peninsular Malaysia and Borneo this summer, and to the British Isles and Spain next spring. They have served as guest tour leaders on two tours to Panama and one tour to Honduras and, having traveled with Cheepers! so many times, they know all of the minute details they need to handle that helped make those trips a success. Their friendly, easy-going manner and excellent birding skills make them ideal as tour leaders, and we know you'll enjoy traveling and birding with "The Uebers". If you're a birder in the Dayton, Ohio area, you know the name, you've probably birded with him, and there's a good chance you took a bird identification class from him. ​Tom Hissong has followed an exciting career path working as an Interpretive Naturalist /Environmental Educator in the Dayton, Ohio area for nearly 41 years. He retired from his position as the Education Manager at the Aullwood Audubon Center and Farm north of Dayton in March of 2017. Prior to his position at Aullwood, Tom served as a naturalist for 2 years with the Five Rivers MetroParks, which followed 16 years in the position of Curator of Education with the Dayton Museum of Natural History. Tom graduated from The Ohio State University in Columbus, Ohio, with a B.S. degree in Environmental Education / Field Biology in 1976. He is well-known throughout the Dayton area for his expertise as an avid ornithology instructor / bird watcher and for his enthusiasm in teaching many children and adult classes on natural history topics each year. Over the past thirty years, Tom has been the planner, organizer and leader of 8 different nine-day expeditions to south Florida and the Everglades for bird study and has led many three-day weekend trips to Pt. Pelee, Canada, to watch birds and to northern Michigan to observe the endangered Kirtland’s Warbler. Listed among his international expeditions are Australia, the Peruvian Amazon and Andes, Kenya, Panama, High Arctic Norway, Costa Rica, Galapagos Islands, and Canadian Rockies. Awards received include Dayton Tripod Camera Club’s 1984 Nature Photographer of the Year, the EarthWatch / Timken Foundation Research for Renewal -Teacher Fellowship, the National Audubon Society ACE Group Award - Flamingo Watch, 1999 Garden Club of Ohio, Inc. - Citation, inducted into Northmont Schools Roll of Honor 2006, 2007 Tamar Chotzen - National Audubon Society Educator of the Year, and 2008 Together Green Leadership Fellow.